Just like a spud-cutting barrel! How do you get the cork out? One way to figure out the center of a cap is to take a washer that's about half the size of the cap and set it inside the cap. Then push it up against the inside edge of the cap and use something like a super fine tip sharpie and draw an arc along the edge of the washer. Then just continue to do this several times going around the inside of the cap and you'll have the middle found. I chucked it in the drill press and I held a pencil very close to the spinning copper barrel section. A little closer and the pencil marked an arc. Adjust and try again, and again, and after 4 tries I had it centered. wow it put the name of the vineyard on and everything! just kidding, it looks good. 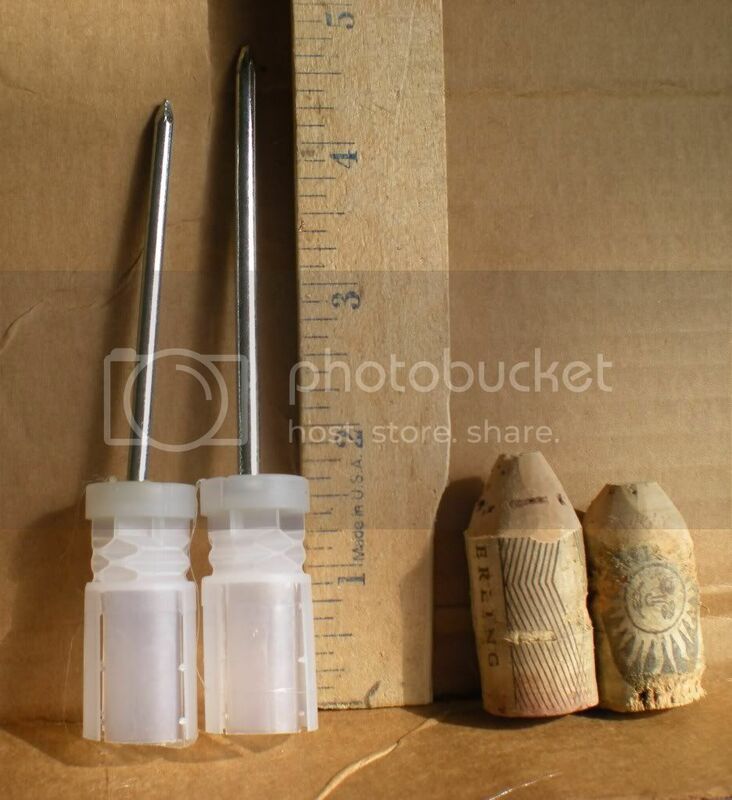 The dart on the left was made from synthetic cork. I like it better than natural cork for darts. Natural seems better for wine. Last edited by boyntonstu on Wed Jan 27, 2010 8:00 pm, edited 1 time in total. Teeth on your cutter would probly ruin your cork's smooth sides. Good thinking. 10 Gauge Shotshell wad nail darts. These are slightly too small in 3/4" Type L copper. However, it shoots very fast. Perhaps the split wad fins splay out for a better seal. On the left is the 10d, then the 16d, and a couple of corks. I tried one shot using a 16d nail and the 10 Gauge wad. It went though the plywood like a hot knife through butter. 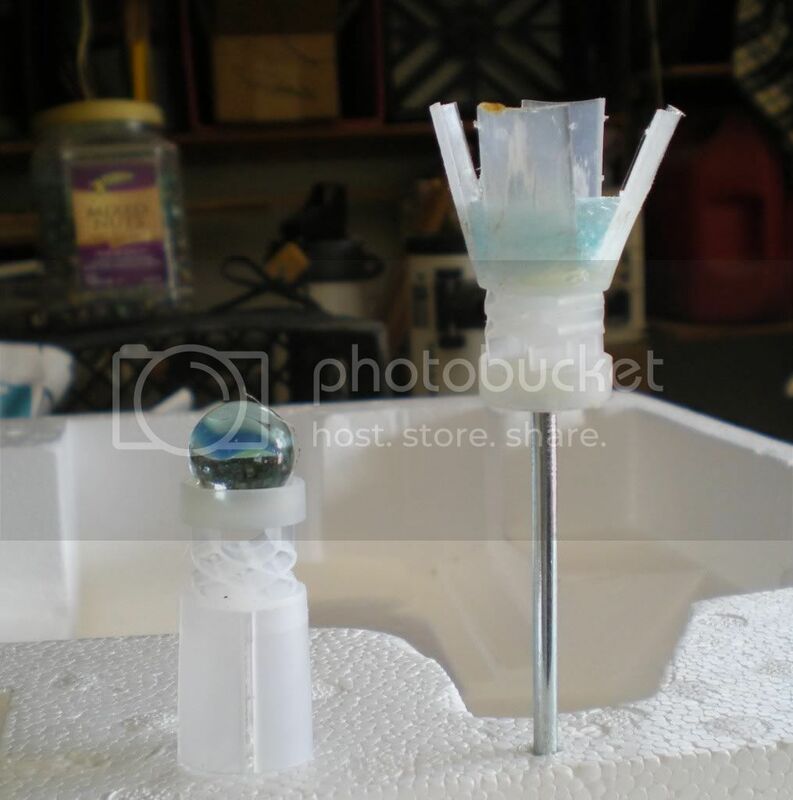 Using hot glue, it takes about 5 seconds to mount a nail on the wad. If you have a 3/4" L barrel I am willing to send you a fewdarts for your evaluation. I would like to see 50 yard penetration, chrono, and ballistic index data. why not use the wad as intended and fill it with nails? jackssmirkingrevenge wrote: why not use the wad as intended and fill it with nails? 10 Gauge wads measure 0.756"
Type L 3/4" copper specs at 0.785"
What do 12 Gauge wads measure? Ah, never mind then, I thought your barrel had an internal diameter of 0.75". 12 gauge sabots are typically around 0.73". 10 bore is the closest gauge to Type L copper. jackssmirkingrevenge wrote: Ah, never mind then, I thought your barrel had an internal diameter of 0.75". 12 gauge sabots are typically around 0.73". 10 bore is the closest gauge to Type L copper. The best fit are the corks cut with the barrel tool. I need to do a comparison test between wads and corks. I prefer to use free corks instead of anything firearm related that I need to purchase. 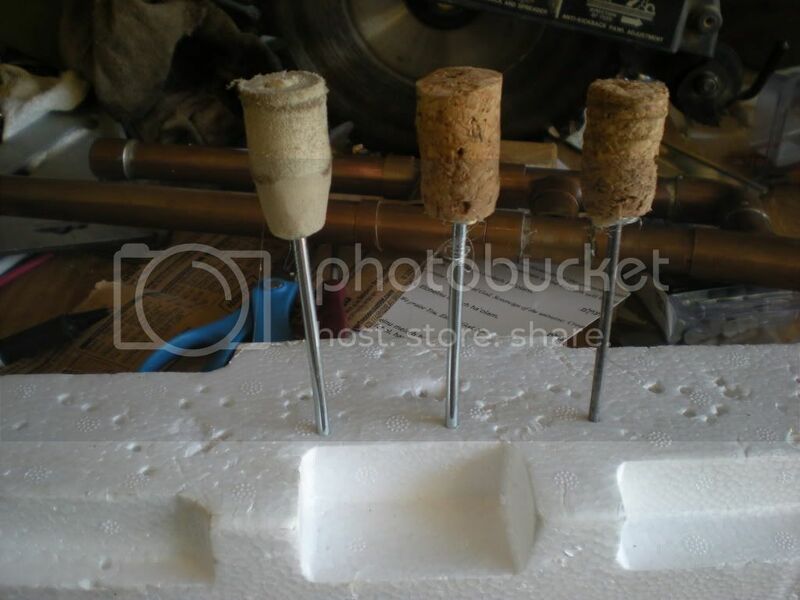 Furthermore, corks can be sanded to an aero shape and they should have a better ballistic coefficient than flat wads. It is the wad diameter that we are attempting to find that would best fit a 0.785" diameter Type L barrel. A marble hot glued to a 10 gauge wad should be more aero than a plain marble. A closed cell disk hot glued to the base of the wad tail make a very good fit to the barrel. I am eager to try it.